Road to Recovery | DBP MAGAZINE ONLINE The World's Best Free Whitewater Publication. Injuring yourself participating in any sport is not uncommon, and whitewater paddling of any form is no exception. After sustaining a torn Achilles tendon from a kayaking accident (Story here), I spent the next week entirely on bed rest unable to walk without using crutches. During the second week I was able to put pressure on my foot and perform stretches. I did everything I could to ensure I was on the water as quickly as was humanly possible. Aquabound sent me some new gear including a new carbon shred paddle that made me want to get back out on the water ever more. I ate tons of protein, took multivitamins and did stretching exercises that my orthopedic recommended. Last Thursday and Friday I fixed my boat in preparation for Saturday, the day I was hoping to finally get in my boat again. Saturday came and although the levels were not what I was hoping for, I was able to get out and do a quick lap on the Warner in New Hampshire. My foot felt good, and it felt amazing to be back in my boat again. I knew I was ready to step it up. Doanes Falls in MA was the only thing within 3 hours running that was really a solid step up from the Warner, so I headed there on Sunday morning with my friend Ben. The closer I got to Doanes, the more and more anxious and afraid I was getting. 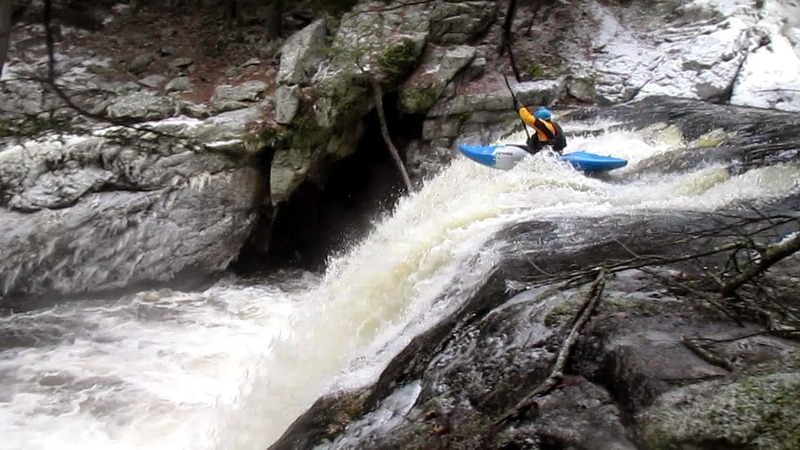 I knew I desperately needed to get out on the water and run a sizable drop to conquer my fears. After some scouting, I decided I was good to go. At first I was planning on starting with the relatively straightforward 20-25 foot falls. Just as I was about to put on the fear within me subsided and I felt calm and at peace (as I usually do on a river). So I decided to put on above the falls and run the 35 foot cascade known as evil onslaught from hell. As I paddled towards the lip of the lead in boof I regained all my confidence and decided to crossbow the boof. After styling evil onslaught from hell and the next falls, I knew I was back! We walked up to the put-in drop at the bridge and we both had nice clean runs on it, and I freewheeled the last fifteen footer. At this point we walked down to look at the last drop (Bonecrusher) which I had previously run about a month prior (a first descent to my knowledge). The drop consists of a ten foot chasm of water that falls in a narrow crack between two boulders and lands on slide that then falls off a solid fifteen foot drop onto rocks. The line involves bracing down the lead in drop and landing in the precise location on the slide that carries the flow over the final drop just to the right of where it lands on a diamond shaped rock that would surely break something. Once you drop in you are committed and there is no room for error. Before my injury, I would probably have fired this drop up at this point,and most likely I would have had a successful run. Instead I opted to walk the drop and come back another day when my foot was fully healed and there was a higher flow (allowing for a slightly better margin of error off the final drop). To me this was my greatest accomplishment of the day, being able to walk away from a drop knowing I could run it, yet not regretting it in the slightest. 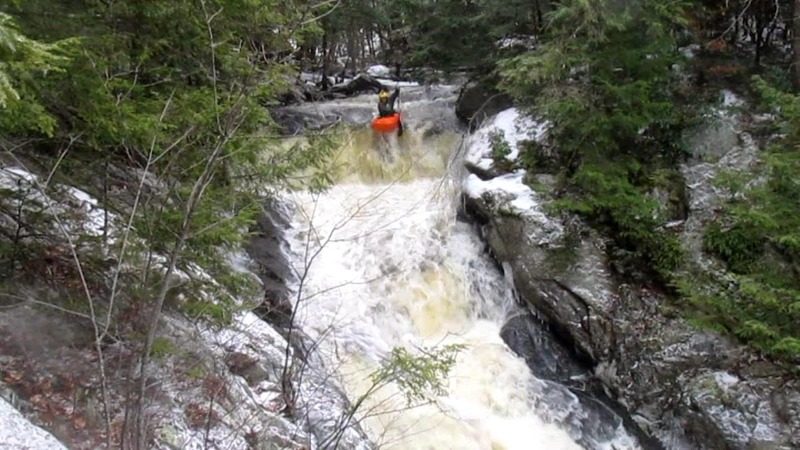 DOANES FALLS 12-21-14 ROAD TO RECOVERY from Alex DePue on Vimeo.